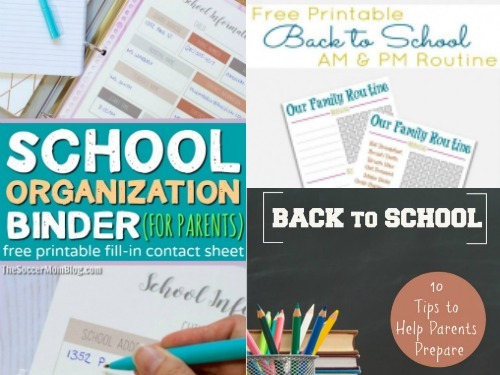 Here are 17 awesome back to school organizing strategies to streamline and simply your life that will make school days a breeze for the entire family. School mornings can be stressful and can get the day started off on the wrong foot. The night before a school day may be just as stressful if homework hasn’t been done, chores aren’t finished, or nothing is organized for the next day. All of these things play put a toll on not only the children, but parents too. Stress is a huge health risk and anything we can do to keep it to a minimum is worth implementing. Routines are something both parents and kids will benefit from in so many ways. Everyone knows what to expect, when to expect it, and stress is minimized. 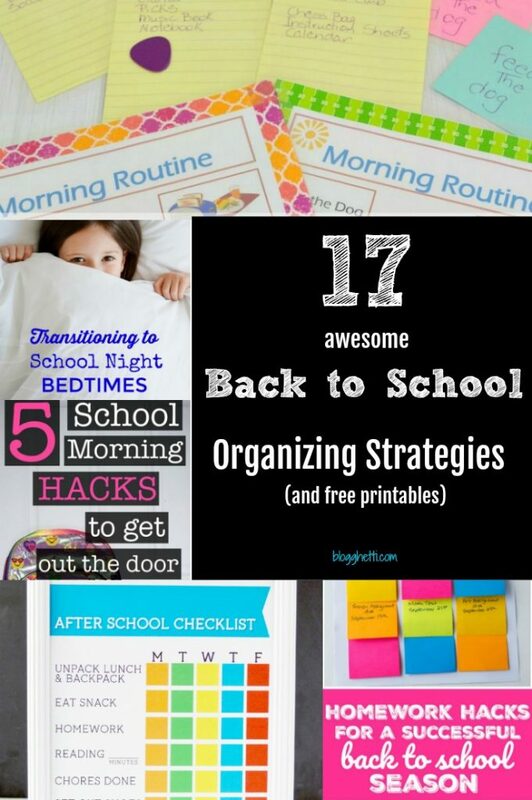 Today on the third part of the Back to School Series, I’m sharing 17 awesome organizing strategies that will get your morning routines off without a hitch, and bedtime schedules will be on point. 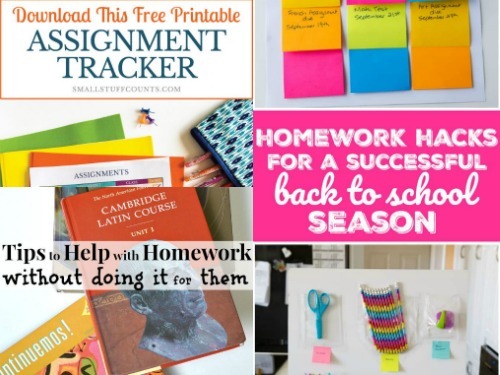 There are homework tips that make life easier for all, ways to commemorate first and last days of school, and tricks to manage all of the papers that come with the school year. Plenty of printable charts that are easy for all kids to understand and help to stay on track, and they serve as reminders for parents too. Be sure to check out the other posts in the series: 30 Easy to Make on-the-go Breakfast Recipes and 15 Easy and Healthy School Lunch Ideas. Next up tomorrow: After school snacks! Back to school times means getting back into a routine, and getting to bed earlier is a must for school-age kids. Jinxy Kids shares 4 tips to transition to school night bedtimes that are easy to implement. School mornings need to be organized and not rushed, and many times we are hurrying to get out the door only to find something to go wrong. 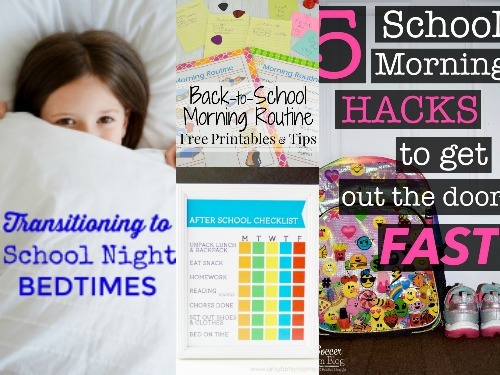 Here are 5 School Morning Hacks from The Soccer Mom Blog that will have you getting out the door fast, but organized and doing less in the mornings. Young kids can benefit from charts and checklists even before they can read by creating them with pictures of common chores and tasks. I love that the free printables from Organized 31 have Back to School Morning Routine printables with and without images! I love lists and checklists, especially if they are helpful to staying on task and on time. This printable checklist for After School tasks is colorful and easy to see what needs to be done. Get the free printable on Artsy Fartsy Mama’s site. Parents will appreciate this list of tips to prepare for the new school year. Get organized with everything from school clothes shopping to where to store the backpacks. Organization Boutique has a simple, yet informative tip list. This School Organization Binder from The Soccer Mom Blog would have been so handy to have when my girls were young. Everything you need to be prepared for school events, teacher info, and more all in one binder. Need a simple daily routine chart? Print this free daily routine checklist out from Thrifty Jinxy. Parents need to be able to multitask, sometimes it’s a challenge to remember everything from your own schedule to your kid’s activities. You need a plan! You need a checklist, a chart, or whatever you want to call it! Crafting a Family has 3 helpful time management printables (free) that will get you started. Being a teacher and a parent has it’s advantages! The “teacher” in you knows what the “parent” needs to know about organizing your child for success. The “parent” in you knows that the teacher will appreciate that your child is ready to go when they get to class, and has their homework done, etc. Great organization tips from a Teacher to a Parent can be found on Teach Mom Repeat. Ease the stress of a new year with a new teacher by trying these 9 ways to make your child’s teacher love you from Taming Frenzy. It’s a win-win for everyone! I confess, I hated to do homework as a child and when I returned to college in my adult years, but I would not have accomplished any of it without a plan and a list! This Assignment Tracker (free printable) from Small Stuff Counts is a perfect tool to use to keep track of every assignment for every subject. 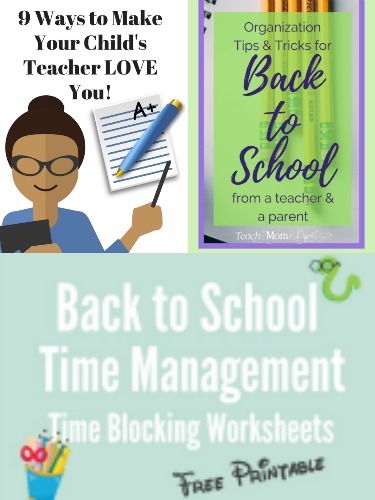 This post by Simply Stacie for Homework Hacks for a Successful Back to School Season is my favorite. Why? Because I love using those sticky notes for everything! They do keep me organized and help me to remember what I need to do. Check out the Homework Station Stacie has created – love it!! As parents we want our children to succeed in school and to do that part of it is to complete homework. I don’t know about you, but sometimes I felt it could have been just as easy to complete a math problem or rewrite a paragraph than explaining how to do so. BUT – who’s learning then? No one! Organized 31 shares 8 tips to help with homework without doing it for them. Each year my girls started a new school year (college included), we took a first day of school picture with the new clothes and shoes. I have each and every picture still and love the memories of each one. All of the cute ways to mark these special days don’t have to be pricey, or complicated. Munofore has cute Cheap and Easy Ways to Commemorate the School Years that are also fun! There’s an app for nearly everything, including your child’s artwork! It’s true! 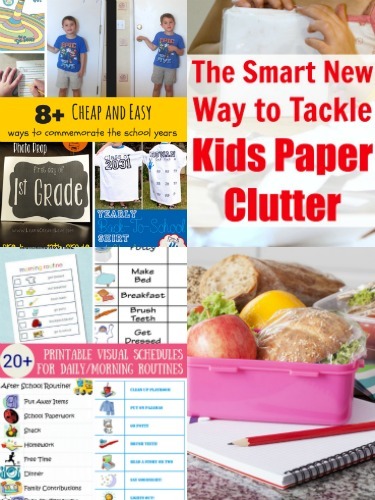 There’s a new way to reduce kids paper clutter and still keep the memories and What’s UP Fagans? tells us all about it! Totally love this one! Getting the lunches packed for school mornings can be a chore for sure, but when you have some tips and preparation time, it’s easy peasy. Mornings can be hassle-free with these school lunch hacks from Family Felicity. And, finally – if you need more checklists and printables to get organized for back to school this year, check out this Ultimate List of Printable Visual Schedules from A Day in Our Shoes. 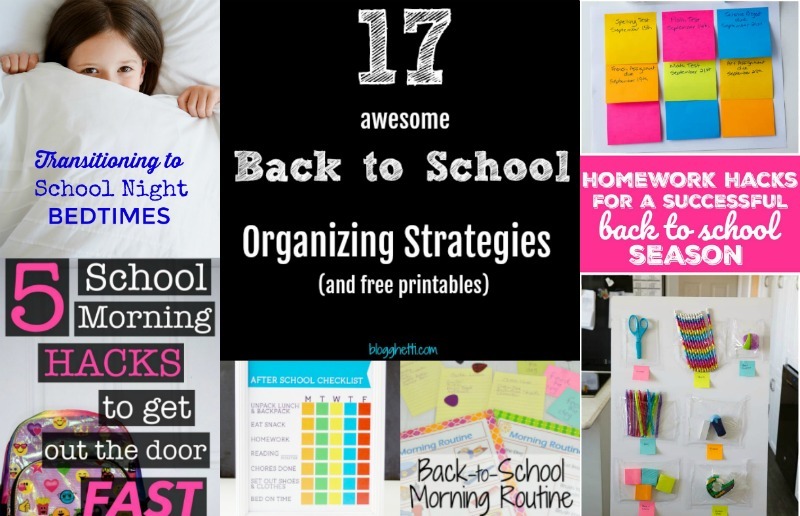 Get organized for a great school year! They were brilliant and savvy and adventurous.